Yesterday, my darling 10 year old son and I did a bit of Christmas baking in the kitchen. 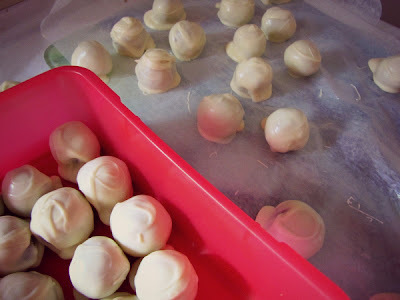 Coconut Ice is also on the agenda to make in the next day or so! (I think a run on the treadmill should also be on the agenda as well). p.s. Check out my blogging buddy Simone's amazing story (that she wrote) that has now been made into a Christmas movie! I love the movie - so cute and such brilliant acting. Visit here to see! What a fun time you had in the kitchen with your boy:) Yummy too! 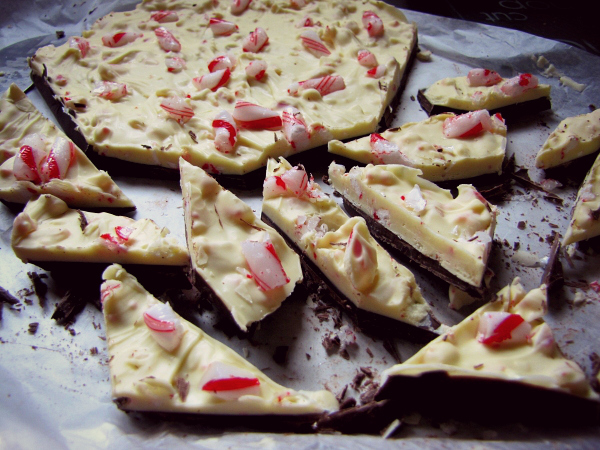 Link is on the word "peppermint bark"- sorry, must make link colour different! Hi Leslie! Yes I have had that happen before and know how frustrating it can be! One tip is cutting it when at room temperature rather than straight out from the fridge. You could also try 'gluing' the layers back together with a thin layer of melted chocolate. All the best - if all else fails I am sure your neighbours will still find it delicious! Yes, I think we were trying to break it in pieces before it had come to room temperature. I had a boy eager to try it (and yeah, I was too!! LOL). I had read to use a hot pizza cutter but mine wouldn't cut through it. Again, it may have still been too cold although I did try again later when it had been out a while. Thanks again and Merry Christmas! aha - now I know where Jaz found this recipe - she made us some for Xmas - it was amazing!!! !